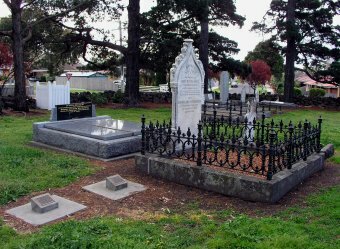 This cemetery is located in the south-eastern corner of Rosedale Drive and Gardenia Road, Thomastown. 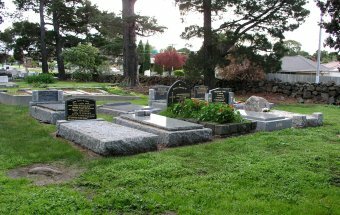 The Genealogical Society of Victoria has the Headstone Transcriptions for the cemetery and they date from the 11th December, 1852 to 29th November, 1978. The transcriptions in our Vertical File were completed on the 26th June, 1980 by Robert Wuchatsch. 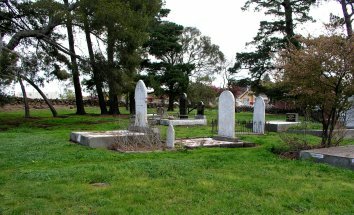 Westgarthtown was also known as Dry Creek , Keelbundoora and New Mecklenberg and was first settled by Germans in 1850 with the site for the church, school and cemetery set aside in 1851. The area was also known as Germantown by non-residents. Many of the inscriptions were in Gothic lettering in the German language. There are a number of unmarked graves. Germans first settled in Thomastown (Westgarthtown) and it was one of the earliest German settlements in Victoria. The town was named after William Westgarth, Melbourne businessman and member of parliament, who was responsible for their immigration. An excellent write up on this cemetery can also be found in "Cemeteries: Our Heritage", edited by Celestina Sagazio for the National Trust (Victoria). SIEBEL: Johann Gottlob. B.30/12/1812 Zauchau,Schlesien. D.2/10/1877. Also his wife Christiane b.26/4/1819 Rettkau, Schlesien. 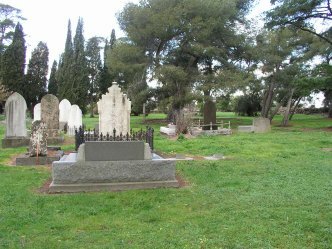 Also the family of John Wuchatsch are buried there. There are 3 graves for the family.